QUANTI-Luc™ is a lyophilized assay reagent containing all the components required to quantitatively measure the activity of Lucia luciferase and other coelenterazine-utilizing luciferases. QUANTI-Luc™ is optimized for use with Lucia luciferase reporter cell lines for fast and efficient real-time measurements directly from the cell culture media. QUANTI-Luc™ contains the coelenterazine substrate for the luciferase reaction, which produces a light signal that is quantified using a luminometer and expressed as relative light units (RLU). The signal produced correlates to the amount of luciferase protein expressed, indicating promoter activity in the reporter assay. One step reagent: just add water to prepare the assay reagent. Substrate stability: reconstituted substrate is stable for up to a month, allowing multiple application use. For increased signal intensity and stability, InvivoGen has developed QUANTI-Luc™ Gold. 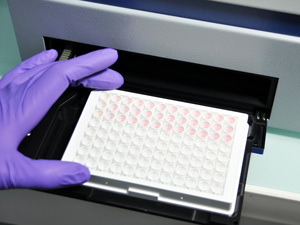 QUANTI-Luc™ Gold has been optimized for high throughput screening (HTS) assays. QUANTI-Luc™ is provided as packs of individually sealed pouches. Each pouch contains everything needed to prepare 25 ml of reagent allowing the preparation of 500 wells of a 96-well plate. QUANTI-Luc™ is shipped at room temparature. Store at -20°C up to 12 months. After preparation, product is stable 1 week at 4°C and at least 1 month at -20°C. Note: This product is photosensitive and should be protected from light. 1. 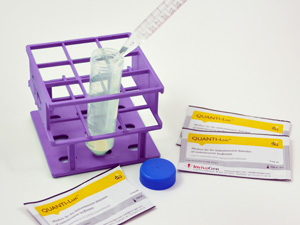 Prepare QUANTI-Luc™ reagent by adding 25 ml water to the contents of one pouch. 2. 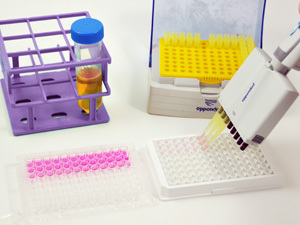 Transfer samples, for instance 10 µl of media from cells containing the secreted luciferase to opaque 96-microwell plates suitable for your luminometer. 3. Set up the luminometer prior to addition of 50 µl QUANTI-Luc™ reagent to each well either manually or by automated injection. Measure luminosity in endpoint mode when using Lucia luciferase or in kinetic mode depending on the coelenterazine-luciferase used. 2018 Nat Commun. 9: 4841. DNA methylation as a mediator of HLA-DRB1* 15: 01 and a protective variant in multiple sclerosis. The mycotoxin alternariol suppresses lipopolysaccharide-induced inflammation in THP-1 derived macrophages targeting the NF-κB signalling pathway. SERMs Promote Anti-Inflammatory Signaling and Phenotype of CD14+ Cells. Behavioural traits propagate across generations via segregated iterative-somatic and gametic epigenetic mechanisms. Mitchell E, Klein SL, Argyropoulos KV, Sharma A, Chan RB, Toth JG, Barboza L, Bavley C, Bortolozzi A, Chen Q, Liu B, Ingenito J, Mark W, Dudakov J, Gross S, Di Paolo G, Artigas F, van den Brink M, Toth M.
2016 Methods Mol Biol. 1393:105-11. Exploiting secreted luciferases to monitor tumor progression in vivo. Principles Governing DNA Methylation during Neuronal Lineage and Subtype Specification. Sharma A, Klein SS, Barboza L, Lohdi N, Toth M.
2016 Chem Commun (Camb). 52(98):14161-14164. Cellular delivery of enzyme-loaded DNA origami. IL-24 Inhibits Lung Cancer Cell Migration and Invasion by Disrupting The SDF-1/CXCR4 Signaling Axis. 2015 J Biol Chem. 290(36):22236-49. Tikhanovich I, Kuravi S, Artigues A, Villar MT, Dorko K, Nawabi A, Roberts B, Weinman SA. Defining CD4 T cell memory by the epigenetic landscape of CpG DNA methylation. Komori HK, Hart T, LaMere SA, Chew PV, Salomon DR.
2014 J Biol Chem. 289(33):23132-40. Epigenetic Modulation of Intestinal Cholesterol Transporter Niemann-Pick C1-like 1 (NPC1L1) Gene Expression by DNA Methylation. Malhotra P, Soni V, Kumar A, Anbazhagan AN1, Dudeja A, Saksena S, Gill RK, Dudeja PK, Alrefai WA.